Hi there! I am Miles Davis. My foster mom named me that because I remind her of her favorite musician. I will sometimes turn my back to you and make soulful trumpet sounds. I had a really rough life until I came to Mickaboo. I was once a free bird living a happy life in the Amazon forest until I was captured and brought to the U.S. I was then put in a cage for over 27 years and left by myself on a back porch. The people who had me didn’t know what to feed me, so I ate lots of meat and people food for all those years, so when I got to Mickaboo, I was very weak and fat. The vets were pretty scared for me, but my foster mom has been feeding me a great pelleted diet and fruit and some veggies (I am still trying to learn to like veggies). I still can’t fly, but I can now flap my wings. When my foster mom first got me I couldn’t even lift them up. Because I didn’t get much attention for so long, I am not a talker. I can say “hello,” “what,” and whistle at you. I am actually a pretty quiet little guy. I can sit in my mom’s lap and have my head pet for hours and that makes me really happy. But, you still have to remember that I am an amazon, and I can and do sometimes bite. Mom has me pretty well figured out now, and can tell you what will set me off. Mom has an outdoor aviary that I like to be in when the weather is nice. My favorite toys are the bird toys that have wiffle balls on them! I am also a good shower partner and I love car rides. 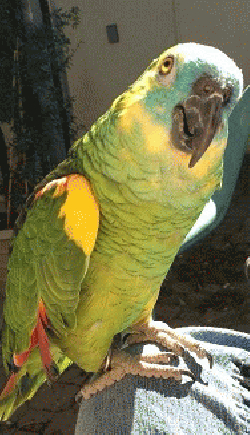 I am a very mellow bird and Hope to find my forever home and someone to love me as much as I love them very soon. Maybe that person is you?